Full name is Erasmo Jose Ramírez Olivera. He and his wife, RheaAnne, have a son, Addison Maree. Signed by Bob Engle and Ubaldo Heredia (Mariners). Named Nicaragua Athlete of the Year in 2011 and 2013 by the Instituto Nicaraguense de Deportes. Went 2-4 with a 6.50 ERA (33 ER/45.2 IP) in 10 starts with the Mariners...Missed more than 3 months of the season on the disabled list. Opened the season on the 10-day disabled list with a right shoulder-latissimus dorsi strain...Made 1 rehab start on 4/7 with High-A Modesto. His rehab assignment was transferred to Triple-A Tacoma on 4/10...Made 2 starts with the Rainiers. Activated for a pair of ML starts on 4/22 at TEX and 4/27 at CLE before returning to the 10-day disabled list with a right Teres Major strain on 5/1. Began a rehab assignment on 7/20...Activated on 8/12. From 8/12-9/9, went 2-1 with a 3.68 ERA (12 ER/29.1 IP), 23 SO, and 8 BB in 6 starts...Allowed 2 or fewer ER in 5 of those 6 starts. Following the season, pitched for the MLB team in the 6-game Japan All-Star Series in November...Threw 5.0 scoreless innings of relief in Game 6 on 11/15 (2 H, 0 BB, 7 SO)...Also started Game 2 on 11/10. The Totals - Was 5-6 with 1 save and a 4.39 ERA (64 ER, 131.1 IP) with 109 strikeouts in 37 games, including 19 starts, with Tampa Bay and Seattle... NW - Was 1-3 with a 3.92 ERA (27 ER, 62.0 IP) with 54 strikeouts in 11 starts with Seattle... The Trade - Acquired from Tampa Bay in exchange for Steve Cishek (rhp) on July 28 and added to active roster on July 30... Up & Down - Was 1-3 with 3.63 ERA (27 ER, 67.0 IP) with 58 strikeouts in final 14 games (11 GS)…from May 19-July 5, had 6.58 ERA (29 ER, 39.2 IP) in 11 games (7 GS)…began year 2-0 with 2.92 ERA (8 ER, 24.2 IP) with 18 strikeouts in first 12 games (1 GS)... Leading The Way - After being added to the Seattle roster on July 30, he led the Mariners in starts (11), innings (62.0) and strikeouts (54)... With Rays - Was 4-3 with 1 save, 6 holds and a 4.80 ERA (37 ER, 69.1 IP) in 26 games (8 starts)…limited opponents to a .189 (20x106) average…as reliever, he went 1-1 with 1 save, 6 holds and a 3.23 ERA (11 ER, 30.2 IP) with 23 strikeouts and 6 walks in 18 appearances... Start It Up - Was 4-5 with a 4.74 ERA (53 ER, 100.2 IP) with 86 strikeouts in 19 combined starts with Seattle and Tampa Bay... Home & Away - In 15 games (9 starts) at his home ballpark, was 4-0 with a 2.49 ERA (17 ER, 61.1 IP) with 53 strikeouts and 12 walks…on the road, was 1-6 with 1 save and a 6.04 ERA (47 ER, 70.0 IP) with 56 strikeouts in 22 outings (10 starts)... Length - Tossed 6.0+ innings in 7 of his 11 starts with Seattle and 5.0+ in 9 of those 11... Limiting Damage - Limited opponents to 2 earned runs or less in 7 of his 11 starts and 3 runs or less in 9 of them. Made a team-leading 64 apps (1 start) in his first full season as a reliever…his 85 IP as a reliever led the American League, ranked 2nd in the majors behind Padres LH Brad Hand (89.1) and were most by a Rays pitcher since LH J.P. Howell (89.1) in 2008...His 11 losses as a reliever were the most by a major leaguer since LAA Scot Shields (11) in 2005 and set a club record, passing RH Brad Boxberger (10) in 2015…his 7 wins included 6 in relief, one shy of the club record for a reliever (last J.P. Howell in 2009)...His 17 decisions in relief were the most by a major league reliever since 2010, when WAS Tyler Clippard went 11-8...Led the majors with 35 relief apps of 4 outs or more, eight more than anyone else (HOU Chris Devenski, 27)…made 20 relief apps of at least 2 IP, tying BAL Vance Worley and Devenski for the major league lead...Yielded 14 HR, most among AL relievers and tying Brian Meadows (2006) and Travis Harper (2005) for the club record for a reliever...Allowed a pair of walk-off home runs, both at Yankee Stadium (Brett Gardner on April 23, Tyler Austin on Sep 8)…became the first pitcher to yield 2 walk-off HR to the Yankees in a season since DET Willie Hernandez in 1988...Nine of his 11 losses and 9 of his 14 HR allowed came on the road…went 3-2 with a 2.66 ERA (47.1-IP, 14-ER) at Tropicana Field...Began the season 4-0 over his first 6 apps (1 start), the first pitcher in club history with 4 wins through the team's first 15 games…the only other pitcher to do that in 2016 was CWS Chris Sale…also became the first Ray to earn 6 wins through the team's first 28 games...Made his only start on April 16 vs. CWS, a 7-2 Rays win…his line: W, 3 H, 0 R, 0 BB, 4 SO...On June 2 at MIN, his bases-loaded HBP (Brian Dozier) plated the decisive run in a 6-4 loss…it was the third time in club history a bases-loaded HBP scored the decisive run in a loss (last May 4, 2006 vs. NYY, Shawn Camp)...Recorded his first career save on Aug 9 at TOR, retiring all 9 BF on 27 pitches…marked the fewest pitches for a 3-inning save (or longer) in club history…was the third pitcher in club history to record a save on 3 perfect innings, first since Roberto Hernández on Sep 3, 2013 at LAA (3.2 IP)…recorded another save in the season finale, Oct 2 at TEX, working a perfect 10th to preserve a 6-4 win. In his first season with the Rays (and first full season in the majors) set career highs with 27 starts, 163.1 IP and 11 wins...his 11 victories finished one shy of Chris Archer for the team lead and tied Matt Garza (11-9 in 2008) for most by a Rays pitcher the season after he was acquired via trade...yielded 2 ER or fewer in 18 of his 27 starts, and 1 ER or fewer in 13 of 27… From April 19 through the end of the season he was one of the best pitchers in the AL, ranking among league leaders with a 3.02 ERA (4th), .223 opp avg. (4th), .274 opp OBP (3rd), .344 opp SLG (4th) and 1.04 WHIP (2nd)...his ERA stood at 25.31 (5.1-IP, 15-ER) after his first 2 apps, prior to April 19… His 11-6 record (.647) tied for the 10th-best winning pct. in the AL...his 6-1 (.857) record on the road led the AL, ranked 2nd in the majors to CHC Jake Arrieta (13-1, .929) and ranked 2nd in club history to Matt Moore in 2013 (10-1, .909)...his only road loss came in his first road start (April 15 at TOR)...was unbeaten (6-0) in 13 road starts after that, the longest road un-beaten streak in Rays history (prev. 10 by Alex Cobb in 2014)…Led all AL pitchers with a .193 opp avg. and .255 opp OBP against left-handed batters (min. 200 BF)...both of these marks ranked 2nd in Rays history behind LH David Price's Cy Young 2012 season (.171 avg., .227 OBP)… Had 5 starts in which he allowed 2 hits or fewer, tied for the AL lead with six others, including teammates Chris Archer and Nathan Karns...allowed 2 hits or fewer only twice in 35 career starts with Seattle…When receiving 2 runs or more of run support (19 starts), he was 11-1 with a 3.07 ERA (105.2-IP, 36-ER)...received 1 or fewer runs of support in 8 starts, going 0-5 with a 4.53 ERA (45.2-IP, 23-ER)…According to PITCHf/x data, his changeup accounted for 23.1 pct. of his pitches, 9th-highest rate in the majors...41.3 pct. of his strikeouts (52 of 126) came with the changeup...has thrown 811 changeups since last yielding a home run with the pitch (April 17, 2014 at TEX, Shin-Soo Choo)…Averaged only 14.75 pitches per inning, 3rd fewest in the AL behind TOR Mark Buehrle (14.24) and CLE Corey Kluber (14.74)...in Rays history, only James Shields (2011, 2008) and David Price (2013) have matched that mark...on Aug 11 vs. ATL, threw 70 pitches over 7 scoreless innings to beat Williams Perez...the game featured only 182 combined pitches-fewest in any 9-inning game since July 24, 2002, when DET Jose Lima beat KC Paul Byrd, 3-0 (181)…Lowered his walk rate from 4.06 BB/9 IP (2014) to 2.20 BB/9 IP...his 9 starts without a walk fell one shy of David Price's 2013 club record…In his first 2 games for the Rays (April 10 at MIA in relief, April 15 at TOR start), he totaled 5.1 IP, 15 H, 16 R, 15 ER, 6 BB, 6 SO...his 7 runs allowed on April 10 tied Brian Meadows (April 5, 2006 at BAL) for most ever in a Rays debut, and were most by a Rays reliever since Gary Glover on July 10, 2008 at CLE (7)...became the first Rays pitcher ever to allow 7-plus runs in each of his first 2 outings with the team…Moved into the starting rotation for good on May 14 and went 11-5 with a 3.13 ERA (144-IP, 50-ER) in 25 starts thereafter...led the Rays in wins during that span…Allowed 2 runs or fewer in 9 straight starts, May 30-July 18, tied with Drew Smyly (2014-15) for the 2nd-longest streak in franchise history behind Alex Cobb (12 in 2014)…Held the Yankees to a .085 batting avg. (6-for-71), the lowest mark in major league history among qualifying pitchers...went 2-0 with a 1.19 ERA (22.2-IP, 6-H, 3-R/ER) in 6 apps, 3 starts against the Yankees...became the first Nicaraguan to beat the Yankees twice in the same season, with a 6-1 win on May 14 at home (5-IP, 1-H, 0-R) and an 8-1 victory on July 5 at Yankee Stadium (6-IP, 3-H, 1-R)…In a no-decision Sep 14 vs. NYY, lost a no-hit bid when Carlos Beltran led off the 8th inning with a single...became the sixth pitcher in Rays history to carry a no-hitter into the 8th inning, first since Alex Cobb on Sep 11, 2014 at NYY (7.1 hitless)...his line: ND, 7.2 IP, 1 H, 0 R, 2 BB, 6 SO, 98 pitches, 62 strikes...Rays eventually fell, 4-1…In September, led the majors with a 14.00 SO/BB ratio (28-SO, 2-BB) and 0.59 BB/9 IP (30.2-IP, 2-BB)...from Sep 14-24, made 3 consecutive starts of 7-plus innings for the first time of his career…Acquired from Seattle a week before Opening Day for LH Mike Montgomery...came to Mariners camp out of options, while competing with Taijuan Walker and Roenis Elias for a rotation spot...Erasmo went 1-2 with a 6.23 ERA (13-IP, 9-ER) in 5 apps, 4 starts in Mariners camp. Went 1-6 with a 5.26 ERA (44 ER, 75.1 IP) in 17 G/14 GS... Ended the season with a 6-game losing streak…after winning season debut, went 0-6,5.53 over ﬁnal 16 appearances... Had 7 separate stints with the Mariners: Opening Day-April 23, May 7, June 3-25, July 22, Aug. 10, Aug. 27 and Sept. 2-end of the season... Recorded career-high scoreless streak of 19.2 innings June 3-24... Allowed career-high 10 runs and 9 hits in 3.0 innings Aug. 27 vs. Texas... Earned win in his season debut April 1 at LAA (7.0,6,2,2,0,6,HR)... Went 6-5 with a 3.65 ERA (35 ER, 86.1 IP) in 15 G/14 GS with Triple-A Tacoma... Went 4-1, 2.45 ERA (7 ER, 25.2 IP) over last 5 G/4 GS with the Rainiers... Pitched for Cardenales de Lara in the Venezuelan Winter League…went 2-0, 0.30 ERA (1 ER, 30.0 IP) with 22 strikeouts in 5 starts…opened with 26.0 consecutive scoreless innings. Went 5-3 with a 4.98 ERA (40 ER, 72.1 IP) in 14 G/13 GS over two stints with the Mariners. Made his first start of the season at the Major League level July 11 vs. the Red Sox…recorded a ND in Mariners 7-8 loss in 10 innings (4.2,6,7,7,4,4,HR). Career-high 4-game win streak July 23-Aug. 13, going 4-0 with a 5.84 ERA (16 ER, 24.2 IP) over 5 G/4 GS… had a 7.30 run support average during this stretch. Averaged 3.24 walks per 9.0 innings (26 BB), compared to his rookie rate of 1.83 BB/9.0 IP in 2012 (12 BB in 59.0 IP). Allowed at least one home run in 9 of 13 starts…allowed only 6 home runs in 16 G/8 GS as a rookie in 2012. Recalled from AAA Tacoma on July 11 and optioned to Short-A Everett on July 12 (to make starts on normal rest). Started the season on the minor league DL (April 11-May 28) with right triceps tendinitis. One of four Nicaraguan-born players to appear in MLB during the season…also: Everth Cabrera - SD, Wilton Lopez - COL, J.C. Ramirez - PHI. Pitched for Cardenales de Lara in the Venezuelan Winter League (3-1, 2.86 ERA, 6 GS). Went 1-3 with a 3.36 ERA (22 ER,59.0 IP) in 16 G/8 GS over twostints with the Mariners ... In 8 starts went 1-3 with a 3.64ERA (19 ER, 47.0 IP)...finishedseason with four consecutivequality starts (1-1, 2.96 ERA) ... Averaged 1.53 BB/9.0 IP in 8starts...walked 4 batters in finalstart Sept. 30 after walking only 4batters in previous 7 starts ... Struck out career-high 10 battersJune 25 vs. Oakland (L#2;8.0,3,1,1,1,10)...at the time becamethe 8th Mariners rookie (17th time) to record 10 strikeouts in a game...at 22 years,54 days, was 4th-youngest Mariner to record a double-digit strikeout performance...FelixHernandez was only younger pitcher ... Recorded his first Major League win Sept. 11 at Toronto (7.0,6,2,2,1,6) ... Left start June 30 vs. Boston after 2.2 IP...on 15-day DL July 1-Aug. 5 with a right elbowflexor strain...optioned to AAA Tacoma after rehab assignment with AAA Tacoma ... Made first Major League start June 14 vs. San Diego, suffering the loss (5.0,8,6,5,1,3) ... Opened season in bullpen going 0-0, 2.25 ERA (3 ER, 12.0 IP) ... Made his MLB debut April 9 at Texas at 21 years, 343 days of age...youngest Seattle pitcherat the time of his debut since Ryan Feierabend (21.022 on 9/13/06) and 17th-youngest inclub history...was the youngest player on any MLB Opening Day roster ... Optioned to AAA Tacoma on May 5 (Kelley recalled)...went 0-0, 2.45 (3 ER, 11.0 IP) in 7 reliefappearances prior to option ... Went 6-3, 3.72 ERA (32 ER, 77.1 IP) in 15 starts for the Rainiers. Split season between AA Jackson and AAA Tacoma, going 10-8 with a 4.83 ERA (82 ER, 152.2 IP), while walking 41 and striking out 116 in 26 starts ... led all Mariners farmhands with 10 wins...had a 1.42 walks per 9.0 inning (41 BB, 152.2 IP), including only allowing 1 walk over first 5 starts of the season with the Generals and just 2 walks over first 9 starts (60.0 IP) ... set a career-high tossing 8.1 innings and also marked 4th time in career to record at least 10 K's in a game and 2nd-highest total in career on Aug. 14 vs.Iowa (8.1,7,1,1,0,11,HR) ... played for Lara in the Venezuelan Winter League, going 2-1 with a 1.48 ERA (5 ER, 30.1 IP) in 6 starts (1 BB, 20 K)...listed by Baseball America as the Mariners No. 13 prospect. Named Clinton's Pitcher of the Year by the Mariners ... ranked 4th among all Mariners farmhands with a 2.97 ERA...named to the MWL Midseason and Post-Season All-Star Team ... finished 5th in the league in ERA (2.97), while ranking 2nd in WHIP (1.07), 3rd in inning (151.2), lowest walks per 9.0 inning for starters (1.34), fewest baserunners per 9.0 innings (10.60) andT5th in wins (10) ... led team with 14 quality starts ... tossed 20.0 consecutive scoreless innings over 4 starts, July 25-Aug. 5 ... struck out career-high 12 batters over 6.0 IP, Aug.5 at Quad Cities. Spent season in the Venezuelan Summer League, leading the league in ERA, wins, strikeouts and innings pitched ... named Seattle Mariners Minor League Pitcher of the Year and the VSL Most Valuable Pitcher ... also named VSL Most Valuable Player ... went 11-1 with 0.51 ERA in 14 games (13 GS) ... limited opponents to .174 (54x310) batting average...season-high 7-game win streak (7-0, 0.71 ERA, 4 ER, 51.0 IP), June 23-Aug. 4 ... struck out 10 batters in back-to-back starts, May 25 and 31...did not allow an earned run in 26.0 consecutive innings over 5 starts, June 12-26. Made professional debut in the Venezuelan Summer League, going 4-1 with a 2.86 ERA (20 ER, 63.0 IP) in 13 games, 11 starts ... allowed 2 or less earned runs in 8 of 11 starts. April 19, 2019 Boston Red Sox designated RHP Erasmo Ramirez for assignment. April 16, 2019 Boston Red Sox selected the contract of RHP Erasmo Ramirez from Pawtucket Red Sox. December 18, 2018 Boston Red Sox signed free agent RHP Erasmo Ramirez to a minor league contract and invited him to spring training. December 18, 2018 RHP Erasmo Ramirez assigned to Pawtucket Red Sox. 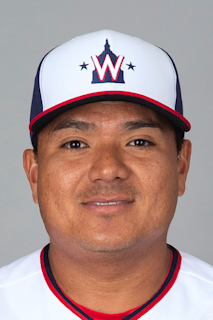 November 2, 2018 RHP Erasmo Ramirez elected free agency. November 2, 2018 Seattle Mariners sent RHP Erasmo Ramirez outright to Tacoma Rainiers. August 12, 2018 Seattle Mariners activated RHP Erasmo Ramirez from the 10-day disabled list. July 31, 2018 Seattle Mariners sent RHP Erasmo Ramirez on a rehab assignment to Arkansas Travelers. July 20, 2018 Seattle Mariners sent RHP Erasmo Ramirez on a rehab assignment to Tacoma Rainiers. May 1, 2018 Seattle Mariners placed RHP Erasmo Ramirez on the 10-day disabled list. Right Teres Major strain. April 22, 2018 Seattle Mariners activated RHP Erasmo Ramirez from the 10-day disabled list. April 10, 2018 Seattle Mariners sent RHP Erasmo Ramirez on a rehab assignment to Tacoma Rainiers. April 7, 2018 Seattle Mariners sent RHP Erasmo Ramirez on a rehab assignment to Modesto Nuts. July 28, 2017 Seattle Mariners traded RHP Steve Cishek to Tampa Bay Rays for RHP Erasmo Ramirez. May 6, 2017 Tampa Bay Rays activated RHP Erasmo Ramirez from the paternity list. May 4, 2017 Tampa Bay Rays placed RHP Erasmo Ramirez on the paternity list. April 30, 2015 Tampa Bay Rays placed RHP Erasmo Ramirez on the paternity list. March 31, 2015 Seattle Mariners traded RHP Erasmo Ramirez to Tampa Bay Rays for LHP Mike Montgomery. November 4, 2014 RHP Erasmo Ramirez assigned to Cardenales de Lara. September 2, 2014 Seattle Mariners recalled RHP Erasmo Ramirez from Tacoma Rainiers. August 28, 2014 Seattle Mariners optioned RHP Erasmo Ramirez to Tacoma Rainiers. August 27, 2014 Seattle Mariners recalled Erasmo Ramirez from Tacoma Rainiers. August 11, 2014 Seattle Mariners optioned RHP Erasmo Ramirez to Tacoma Rainiers. August 10, 2014 Seattle Mariners recalled Erasmo Ramirez from Tacoma Rainiers. July 23, 2014 Seattle Mariners optioned RHP Erasmo Ramirez to Tacoma Rainiers. July 22, 2014 Seattle Mariners recalled Erasmo Ramirez from Tacoma Rainiers. June 25, 2014 Seattle Mariners optioned RHP Erasmo Ramirez to Tacoma Rainiers. June 3, 2014 Seattle Mariners recalled Erasmo Ramirez from Tacoma Rainiers. May 8, 2014 Seattle Mariners optioned RHP Erasmo Ramirez to Tacoma Rainiers. May 7, 2014 Seattle Mariners recalled Erasmo Ramirez from Tacoma Rainiers. April 29, 2014 RHP Erasmo Ramirez assigned to Tacoma Rainiers from High Desert Mavericks. April 24, 2014 Seattle Mariners optioned RHP Erasmo Ramirez to High Desert Mavericks. November 13, 2013 RHP Erasmo Ramirez assigned to Cardenales de Lara. September 3, 2013 Seattle Mariners recalled Erasmo Ramirez from Tacoma Rainiers. August 30, 2013 Seattle Mariners optioned Erasmo Ramirez to Tacoma Rainiers. July 23, 2013 Seattle Mariners recalled Erasmo Ramirez from Everett AquaSox. July 12, 2013 Seattle Mariners optioned Erasmo Ramirez to Everett AquaSox. July 11, 2013 Seattle Mariners recalled Erasmo Ramirez from Tacoma Rainiers. June 2, 2013 Erasmo Ramirez assigned to Tacoma Rainiers from Jackson Generals. May 28, 2013 Erasmo Ramirez assigned to Jackson Generals from Tacoma Rainiers. April 3, 2013 Erasmo Ramirez roster status changed by Tacoma Rainiers. March 27, 2013 Seattle Mariners optioned RHP Erasmo Ramirez to Tacoma Rainiers. September 1, 2012 Seattle Mariners recalled Erasmo Ramirez from Tacoma Rainiers. August 5, 2012 Seattle Mariners optioned Erasmo Ramirez to Tacoma Rainiers. August 5, 2012 Erasmo Ramirez roster status changed by Tacoma Rainiers. July 25, 2012 sent RHP Erasmo Ramirez on a rehab assignment to Tacoma Rainiers. July 1, 2012 Erasmo Ramirez roster status changed by Seattle Mariners. June 13, 2012 Seattle Mariners recalled RHP Erasmo Ramirez from Tacoma Rainiers. May 5, 2012 Seattle Mariners optioned Erasmo Ramirez to Tacoma Rainiers. March 26, 2012 Seattle Mariners selected the contract of Erasmo Ramirez from Tacoma Rainiers. March 26, 2012 Erasmo Ramirez roster status changed by Seattle Mariners. January 26, 2012 Seattle Mariners invited non-roster RHP Erasmo Ramirez to spring training. October 12, 2011 RHP Erasmo Ramirez assigned to Cardenales de Lara. August 1, 2011 Erasmo Ramirez assigned to Tacoma Rainiers from Jackson Generals. April 4, 2011 Erasmo Ramirez assigned to Jackson Generals from Clinton LumberKings. March 8, 2011 RHP Erasmo Ramirez assigned to Seattle Mariners. April 17, 2010 Erasmo Ramirez assigned to Clinton LumberKings from VSL Mariners. March 4, 2010 RHP Erasmo Ramirez assigned to Seattle Mariners. September 1, 2007 Seattle Mariners signed free agent RHP Erasmo Ramirez to a minor league contract.